SpaceX's first Falcon 1 rocket launches on its ill-fated first flight on March 24, 2006. A fuel leak and subsequent fire ledto the destructionof Space Exploration Technologies' (SpaceX) first Falcon 1rocket seconds after liftoff, the private launch services firm saidSaturday. 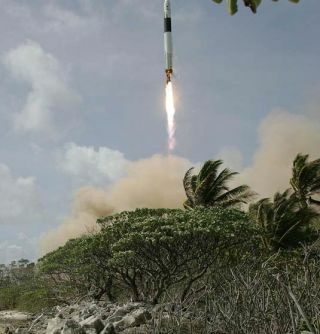 A preliminary SpaceXanalysis into the failedFalcon 1 launch - which lifted off at 5:30 p.m. EST (2230 GMT) on March 24- found that the fuel leak and flames led to an engine shut down just after therocket launched skyward from the equatorial set KwajaleinAtoll on the central Pacific Ocean. The incident marred the debut of SpaceX's Falcon 1, a low-cost rocket intended to allow moreaffordable access to space for satellite payloads. "A fuel leak of currently unknownorigin caused a firearound the top of the main engine," SpaceX chief Elon Musk said in a written update. "On high-resolutionimagery, the fire is clearly visible within seconds after liftoff." Musk said the fire began about 25seconds after liftoff and cut into the Falcon 1 rocket's first stage heliumpneumatic system used to pressurize the booster's fuel tanks. Once thatpressure dropped, the Falcon 1 rocket's Merlin engine shut down about 29seconds after liftoff, he added. A formal launch incident inquiry ledby a U.S. government team in partnership with SpaceXwill also be conducted, the El Segundo, California-based launch firm said. "I cannot predict exactly whenthe next flight will take place, as that depends on the findings of thisinvestigation and ensuring that our next customer is comfortable that allreasonable steps have been taken to ensure reliability," Musk said. "However, Iwould hope that the next launch occurs in less than six months...SpaceX is in this for the long haul and, come hell or highwater, we are going to make this work." Musk also said he was grateful forthe support of his launch customers, who called in their messages after theincident. "We will stand by them as they havestood by us," he said. SpaceX's $6.7 million Falcon 1 rocket, atwo-stage liquid oxygen and kerosene powered booster, is designed to launchpayloads of up to 1,256 pounds (570 kilograms) into low Earth orbit (LEO). Itfeatures a reusable first stage, which is designed to parachute into the oceanfor later pickup, servicing and reuse. The inaugural rocket was expected tolaunch the FalconSat-2satellite, an $800,000 cube-shaped spacecraft designed and built by cadetsat the U.S. Air Force Academy in Colorado. The mission was supported by theU.S. Air Force and Defense Advanced Research Projects Agency. Prior to the March 24 anomaly, SpaceX officials hoped to launch their second Falcon 1rocket and its TacSat-1 satellite payload from Vandenberg Air Force Base inCalifornia later this year. A Malaysian satellite and several smaller payloadswere also set to launch from the atoll staging site in February 2007, the firmsaid. "Our plan at this point is toanalyze data and debris to be certain that the...preliminary analysis is correctand then isolate and address all possible causes for the fuel leak," Musksaid. "In addition, we will do another ground up systems review of theentire vehicle to flush out any other potential issues." Aside from the fatal fuel leak andfire, Falcon 1's other systems appear to have performed as expected during itsinaugural flight, SpaceX said. Musk said the vehicle's main engine,thruster vector controls, avionics, software and other systems functioned asplanned. It does not appear that the rocket's first stage insulation, whichwraps around the booster to insulate its supercoldliquid fuel and was a source of some speculation early after the failed launch,played a negative role in the Falcon 1 rocket's loss, Musk added. The SpaceXchief said he and his firm are committed to rooting out the source of the firstFalcon 1 rocket's failure, and they he believes in "maximum exposure" torelease information on the investigation as it is learned. Musk added that SpaceX is not the first launch service firm to experiencedifficulties in its early space shot attempts. "Having experienced firsthand howhard it is to reach orbit, I have a lot of respect for those thatpersevered to produce the vehicles that are mainstays of space launchtoday," Musk said.